Building on the lesson from last month, let's take another look at safeties made possible with an easy stop shot - and this time integrating a second goal as well. The principle of these safeties is obvious: You want to stop the cue ball behind a blocker ball and send the object ball to an unattainable location. 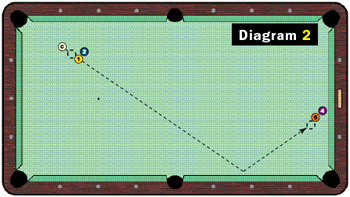 You can increase your facility with the shot by practicing the drill at right in Diagram 1. 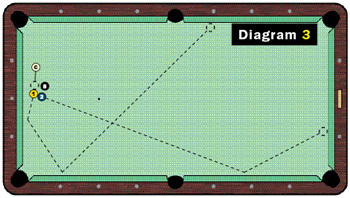 (Assume all 15 balls are lined up between the side pockets, and place the cue ball accordingly for corner-pocket shots. When you've mastered the shot from 12 inches away, move back another diamond.) Again, you typically want to stroke the cue ball so it's sliding on impact and stops dead at the point of object-ball impact. In Diagram 2, assume you have ball in hand. You can execute a stop shot that accomplishes a second goal: breaking up the 4-5 cluster on the head rail. Hit it fairly softly - in case you miss the cluster, your opponent will play right into your hands by breaking it open when he's forced to kick at the 1 ball. The situation in Diagram 3 comes up surprisingly often. Here, the 1 and 2 balls are frozen, and the 1 does not pass. You can use the opportunity to break up the cluster. Next month, we'll look at the advantages of slightly off-center stop shots.